Wiesmann GmbH was a German automobile manufacturer based in Dülmen, Germany. 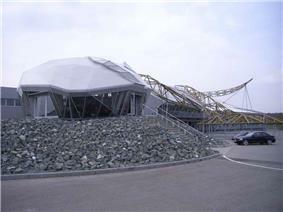 The company was founded in 1988 by two brothers, engineer Martin Wiesmann and businessman Friedhelm Wiesmann. The cars are manufactured by hand in Dülmen. The Wiesmann logo portrays a gecko, as they claim their cars "stick to the road like geckos to a wall". The company originally manufactured custom hard-tops for convertibles, which they continue to do. The first roadster left the workshop in 1993. As of 2006, they produce the Wiesmann MF 3 and MF 30 roadsters and the Wiesmann GT MF 4 coupé, all of which utilize engine and transmission components supplied by BMW. Wiesmann had plans to begin exporting vehicles to the USA by 2010, but recent reports indicate that Wiesmann has no immediate plans to sell vehicles in the United States because of exchange rates and the high costs of modifying and testing the cars in order to make them road-legal there. 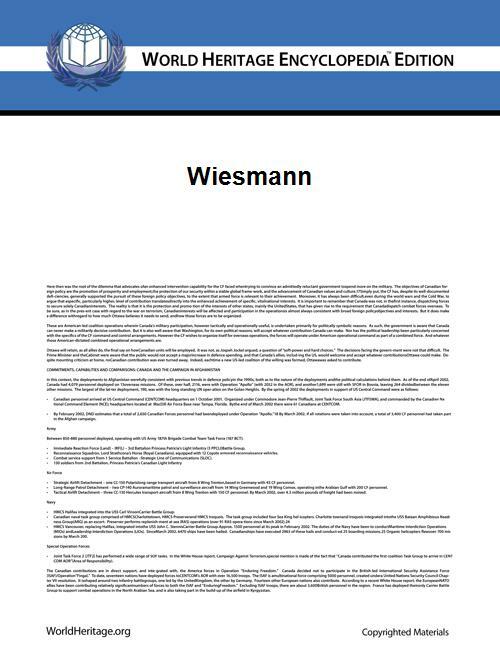 On August 14, 2013 Wiesmann filed for insolvency at the local court in Münster. Later The management board of the Wiesmann corporation has filed the application to dismiss the insolvency proceedings due to abolition of the insolvency reasons. The creditors’ meeting was postponed to December 16, 2013. As of early April 2014, discussions have been held with a UK-based consortium, CMMW, to take over Wiesmann and resume production. 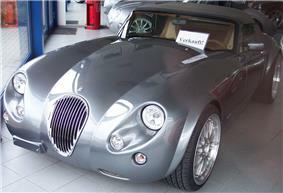 Wiesmann was liquidated in May 2014. Wiesmann MF30 is the first Wiesmann model ever built. The MF 30 is powered by a six-cylinder M54B30 engine borrowed from BMW, with a capacity of 2979 cm3 and a power output of 170 kW/231 hp (231 PS) at 5,900 rpm, reaching 300 N·m (221 ft·lbf) of torque at 3,400 rpm. Due to its dry weight of 1080 kg, the car can accelerate from 0 to 60 mph in 5.9 s with a top speed of 230 km/h (143 mph). The model was discontinued in order to give way to the new slightly modified model named MF 3. Acceleration: 0 –100 km/h: 5.0 sec. The primary difference between the MF 3 and the MF 30 was the new engine. 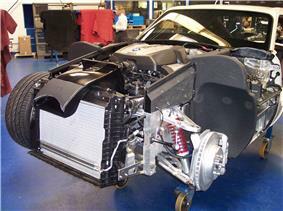 The engine featured on the MF 3 was a BMW S54, which is originally known from the M3 (E46). The engine has a displacement of 3246 cm3 with a maximum power output of 252 kW (343 PS / 343 hp) at 7.900 rpm, and a maximum torque of 365 N·m (269 ft·lbf) at 4.900 rpm. With the new engine and due to its weight of 1,180 kg (2,601 lb), this car can acceleratefrom 0–60 mph in 5.0 sec and reaching a maximum speed of 255 km/h (158 mph). MF3 came with a 5-speed manual transmission as basic, and a 6-speed sequential gearbox as an option. Another additional option were the 20-inch rims running on (front: 235/30/20, rear: 285/25/20) rubber. Acceleration: 0–100 km/h: 5.0 sec. Other models exist such as the MF 28 or the MF 35. The GT is a closed two-seater with more power than the other models, intended for long distance touring. The GT was first produced in 2003.
max. torque/speed 600 N·m (443 ft·lbf) / 1,750-4,500 rpm. Acceleration: 0–100 km/h: 4.6 sec. The GT MF5 is a closed two-seater & two-seater roadster with more power than the other models. The GT MF5 roadster, first produced in 2009, will be limited to just 55 examples. GTspirit gave the GT MF5 Roadster a positive review during their road-test in September 2010. Acceleration: 0–100 km/h: 3.9 sec. ^ "GTSPIRIT Article". GTSPIRIT Article. Retrieved 2011-02-06. ^ SPIEGEL ONLINE, Hamburg, Germany (15 August 2013). "Wiesmann meldet Insolvenz an". SPIEGEL ONLINE. ^ Carscoop Carscoop. 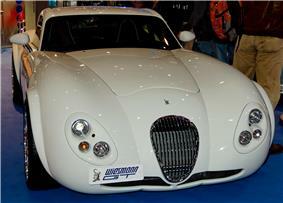 "Wiesmann Emerges from Insolvency, Will Meet Creditors on December 16". Carscoops. ^ Leftlane (8 May 2014). 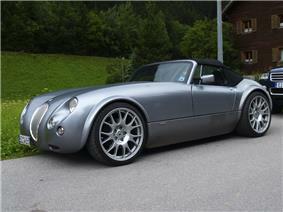 "Germany's Wiesmann shuts down". Leftlane. Retrieved 2015-03-23. ^ "Road Test: Wiesmann Roadster MF5". :. 2010-09-10. Retrieved 2011-08-06.